A massive drought has staunched the city's water supply to a trickle, and the government has privatized the public restrooms. Those who violate the law are banished (allegedly!) to a mysterious place called Urinetown. But Bobby Strong and a motley band of unlikely revolutionaries sound an urgent call to take down the corrupt empire of Caldwell V. Cladwell and his goons who ensure that nobody pees for free. A shameless musical that spoofs shameless musicals, it's the unfortunately titled show that became an utterly improbable Broadway hit and winner of three Tony Awards, including Best Original Score and Best Book of a Musical. 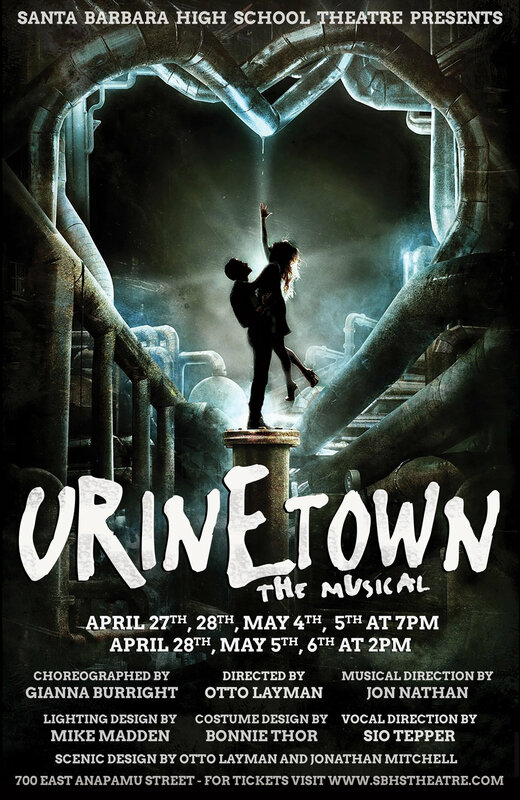 As always at Santa Barbara High School Theatre, Urinetown brings together an all-star collection of designers and performers. Directed and designed by Otto Layman (In this his 50th show at SBHS) and his group of talented artists (Musical Director Jon Nathan, Vocal Director Sio Tepper, Choreographer Gianna Burright, Costume Designer Bonnie Thor, Set Designer and Technical Director Jonathan Mitchell, and Lighting Designer Mike Madden), Urinetown features Sophomore Josie Gillingham as Hope Cladwell, and freshman Daniel Sabraw as Bobby Strong, star-crossed lovers torn between conflicting allegiances. Carter Beaudette portrays Caldwell V. Cladwell, Hope's father and the head of the evil Urine Good Company (or UGC, as it's know for short). Joining him is junior Elvis Pagano (Lockstock), seniors Lily Linz and Cole Hansen (Little Sally and Barrel, respectively); juniors Bella Holland (Penny Pennywise), Penny O'Mahoney (Mrs. Millenium), Gianna Gonzalez (McQueen), Drewes McFarling (Hot Blades Harry); sophomores Logan Fleming (Becky Two Shoes), Ben Kreitzer (Senator Fipp), and Jackson Olbrish (Tiny Tom); seniors Leah and Anna Martin (Dr. Billeaux and Mrs. Strong, respectively), Grace Gibbs (Soupy Sue), and Zoë Padilla (Old Man Strong); and a dynamic ensemble of big voices and characters in Tyler Dahneke, Vivian Shay, Chloe Buckley, Brandon Holland, Isaiah Meyers, Sharp Queener, Buck Lewis, Adrianna Vasquez, Miranda Ortega, and Angela Zevallos.